Tuna is usually sold in supermarket as boneless steaks. Although there is a huge variety of tuna species, only a few sustainably fished species usually make it to the fresh fish counter. Blue fin is the most prized, but it typically comes frozen only. For fresh steaks, albacore and yellow fin -- Ahi -- represent the dominant options. The former yields moist, flaky steaks that take on a gray color after cooking; whereas, yellow fin has a beefy texture and mild taste that makes it a coveted choice for sushi. Fresh tuna steaks should not have a fishy odor and should be dark red in color, not brown. Don’t wash the steaks before cooking as fresh water will discolor the flesh. Simply pat them dry. Bear in mind that thin steaks will always cook to medium, but those thicker than 1 ½ inches give the option of a rare center and seared crust. 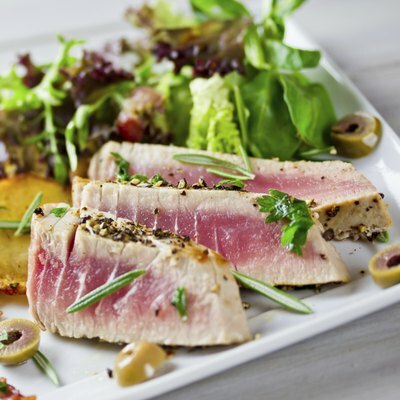 The biggest challenge with tuna steaks is keeping them moist and tender. A quick, assertive heat manages the task. Heat olive oil in a heavy skillet and season tuna steaks -- more than an inch thick -- with salt and pepper. Fry the steaks for just 3 minutes per side. The outside will form a crust, but the inside will remain pink. For a well-cooked steak, add a sauce and simmer until the flesh is opaque. Simmering the pan-fried steaks in sauteed garlic, tomatoes and herbs helps retain moisture. Alternatively, reduce a glaze of soy sauce mirin, citrus juice and sugar until it is thickened; then add the medium-rare tuna steaks. If grilling, oil the steaks to prevent sticking and place over a hot grill, leaving for 2 minutes for the steaks to develop sear marks. If the steak lifts freely, it is ready to flip. Cook on the other side for 2 minutes. To bake tuna steak, preheat the oven to 350 degrees Fahrenheit, and drizzle just a thin sheen of oil on a roasting tray. Pat the tuna steaks dry but brush them with olive oil. For a crust, top the steaks with aromatic extras like chopped olives and capers, and tomatoes. Transfer the steaks to the roasting tray and bake in the oven for 15 to 20 minutes. You can also leave out the dressing and cook the steaks wrapped in aluminum foil with some olive oil. Braising really nurtures the flavors in tuna if you can live without a varied texture. Sear the steaks first in a saute pan of olive oil; then add a cup of white or rose wine. Bring briefly to the boil; then cover the pan and lower the heat, steaming the tuna for 10 minutes. Serve with tart-flavored Mediterranean sides such as olives, capers and red peppers. For blackened tuna, prepare a seasoning from ground peppers and herbs. Dip each tuna steak first in melted butter, followed by the seasoning, covering the steaks completely. Lay the steaks in a hot skillet for 5 minutes, turning once halfway through. Don’t put oil in the skillet as it needs to be as hot as possible, but drizzle the steaks with melted butter as they cook. If cooking a large batch, wipe the skillet clean between steaks to remove any burnt seasoning that accumulates. Be warned that the process produces a great deal of smoke. For a lighter, sharper flavor, dress the cooked steaks with a citrusy salsa of orange or lime juice and fine-chopped scallions, with herbs such as tarragon or thyme. For added moisture, tuna steaks can be marinated in olive oil overnight, with a little lemon juice and zest, along with some garlic. The olive oil prevents the tuna turning into a straightforward ceviche, which can leave the steaks grey and mushy if left too long. Although raw tuna can carry bacteria and parasites, all sushi-grade tuna imported into the U.S. is flash-frozen first, which renders it safe. Keep tuna properly refrigerated below 40 degrees Fahrenheit to prevent scombroid poisoning, which cooking will not destroy. To make sushi, choose the freshest possible steaks and cut against the grain into thin slivers with a sharp knife.